Sitting high atop of the newly renovated Performing Arts Center at Lake Forest Country Day School (LFCDS) is a beautifully restored wood ceiling—lovingly preserved to not only harken back to the past, but to provide the roots for all who gather there to flourish into the future. Originally built as a gym back in the 1950s, the new 4,500-square-foot Performing Arts Center now includes more natural light thanks to windows on both the west and east walls. It also features moveable seating—allowing for more flexibility when it comes to the events that the space will hold in the years ahead. On September 25, the school received their first chance to show off the new Center when they welcomed New York Times best-selling author Dr. Tina Payne Bryson, founder and executive director of The Center for Connection in Pasadena, California. 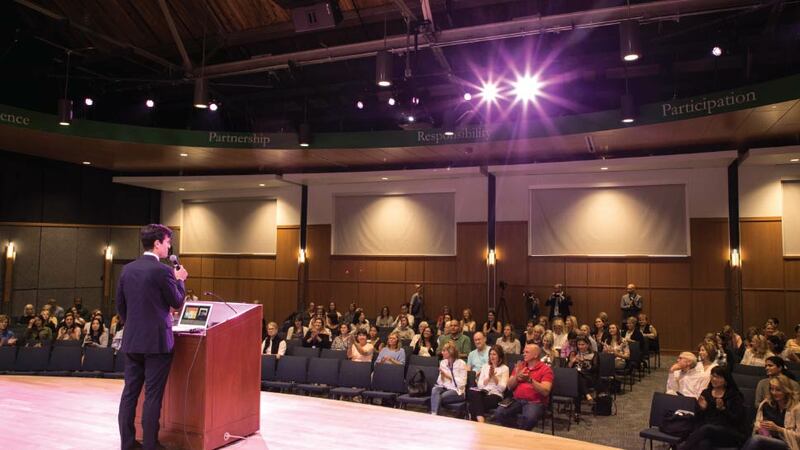 More than 135 parents and educators attended the event as part of the school’s popular Speaker Series. And yes, the space now serves as another impressive piece of the school, which serves students aged 2 through middle school from more than 35 communities throughout the North Shore. Having joined LFCDS in July 2018 after his time as Director of Upper School at The Buckley School in New York City, Hurd says he knows firsthand the impact a revamped space such as this can mean to the entire school. Indeed, the many jewels of this elite school are well known. The education that LFCDS provides has long ensured a student’s success, with particular attention to inspired teaching, academic rigor, students’ individual needs, and responsible citizenship on a global level. The school’s new Performing Arts Center also especially looks to strengthen the school’s already impressive arts program. Lake Forest Country Day School is located at 145 South Green Bay Road in Lake Forest, 847-234-2350, lfcds.org.